No one’s afterlife is as dispiriting as Audrey’s–at least that’s what she believes after waking up dead without her memories and being promptly assigned to hunt demons for the rest of eternity. She’s convinced there’s been a cosmic mistake; after all, she’d rather discuss the color of her nails than break them on angelic weapons. It doesn’t help that her trainer, Logan, is as infuriating as he is attractive. When an ancient weapon of unparalleled power chooses Audrey as its wielder, attracting the cautious gazes of her fellow hunters and the attention of Satan himself, Logan is the only one she can trust. With Satan’s eyes now fixed on Audrey, a battle for the safety of the living looms in the shadows. Fans of The Mortal Instruments and Supernatural won’t want to miss this epic story of unfailing love and adventure. Box set includes Ivy Granger Psychic Detective series Books 1-3 and Bonus Prequel story. 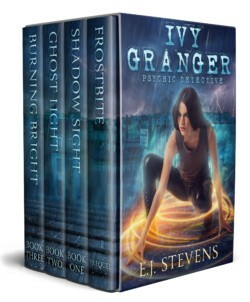 The Ivy Granger Psychic Detective series is known for heart-pounding action, quirky characters, and supernatural horrors. Take a trip to Harborsmouth where you’ll encounter bloodsucking vampires, psychotic faeries, and our favorite snarky detective. In the aftermath of an interstellar war with an alien race, Captain James Drake is unjustly court martialed. But Drake won’t go down without a fight. Rather than surrender, he’ll lead his loyal crew into the frontier worlds to repair and rearm. Fighting the treacherous Lord Admiral Malthorne, Drake makes alliances with aliens and smugglers to clear his name and defeat treason in his beloved homeland. The bestselling STARSHIP BLACKBEARD series, now in a complete compilation for the first time, is over a thousand pages of space battles, alien wars, and interstellar politics. Unfortunately, he doesn’t realize what he is being groomed for as he gets drawn into an obsessed ruler’s schemes. Forced into crimes far worse than stealing bread, Kirrin struggles with who he is becoming, and where it might lead. He knows his life is on the line. How long can he live on borrowed luck? Jema and Troy manage semi-normal lives at the Port Orford Naval Base despite global warming and mandatory genetic typing. With the threat of a second worldwide flu epidemic, their parents send them to a remote desert community. Jema’s sister contracts the virus, and Jema and Troy must decide whether to compromise the group to save one. Can Lovelock develop a cure in time to avoid mass casualty? As the political stage shifts, who can be trusted?